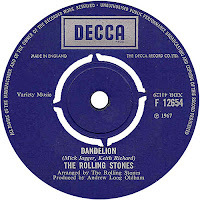 "Dandelion" is a song by the English rock 'n roll band The Rolling Stones, written by Mick Jagger and Keith Richards, and first released as a B-side to "We Love You" in August, 1967. 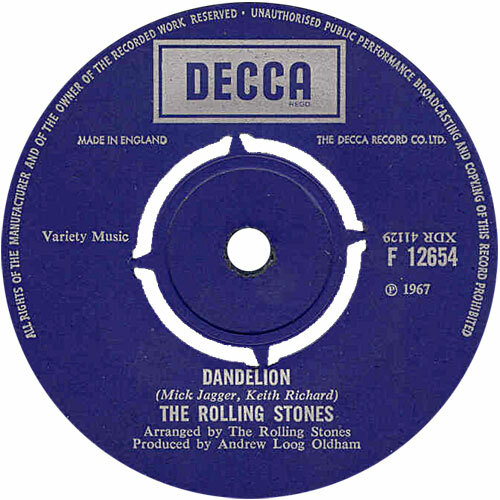 An apparently lighthearted song (with references to the English children's game of using the seedheads of dandelions as clocks) albeit with an undertow of wistfulness, it reached #14 in the United States, and effectively became the A-side there (as the edgier "We Love You" disappointed at #50 on US charts). This is reflected in "Dandelion" appearing on both the US and United Kingdom versions of Through the Past, Darkly (Big Hits Vol. 2) in 1969, while "We Love You" appeared only on the UK version.